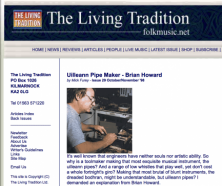 Brian Howard cut his teeth as a tool maker and engineer, then after a stay in Ireland determined to turn his expertees to the creation of traditional instruments and their derivatives, constantly seeking to make improvements in playability and sound. He spent over 40 years working on his renowned Low Whistles and went on to develop his own version of the Uilleann Pipes and Chanter Reeds in addition to beavering away on countless side-projects. Brian still makes Chanter Reeds which are available to order here. Excepts from the interview are reproduced below. to view the complete article in The Living Tradition on the folkmusic.net site. “A big advantage of living in Sheffield is that the city still has a lot of specialist craftsmen; a relic of the cutlery trade where operations were carried out by many workshops. The local term, “Little Mester”, has connotations of the master craftsman who operated on a small scale, perhaps with only an apprentice. So I’m able to consult on a personal basis, and exchange ideas in a two-way flow of information, rather than deal with some impersonal voice in a large company. Within a mile or so of my workshop there are scores of small businesses, with many different skills on offer”. “… when I first made a brass low D whistle in 1974, I wasn’t too pleased with it. Looking back, my understanding of what was happening wasn’t great. When I came back from Ireland in ’84, the first thing was to design the current low whistles which are still selling well. I didn’t like the idea of a one-piece whistle with a metal head, so I worked out an improved design for the mouthpiece, windway, and fipple, to be made by plastic injection moulding. This took out the variables of a two-piece head, had good volume-control, a better response to temperature difference, and allowed production at an affordable price. Since then, the head has been successfully re-designed to improve playing performance. I still like to play one of the originals like yours, just to demonstrate the improvement”. “I’m really concerned that some instruments on sale at present are not of merchantable quality. So you find players who are unsure whether it’s the instrument or themselves that’s at fault. All too often, it’s the instrument. Beginners need very good instruments to start with. A good player can get the best out of a poor instrument; a beginner doesn’t usually know the difference. So if beginners pay as much as they can afford, and the instruments are duff, they may become discouraged and blame themselves; usually quite unfairly”. “Most of my low whistles are of nickel-plated brass. Some have an electro-static powder coating fused on, which makes for ease of handling. Unlacquered brass is popular with experienced players because it’s more resonant. Solid silver is also available; for some reason these are more expensive. I made a gold-plated whistle as a presentation instrument for an old friend. Due to internal corrosion, aluminium is not suitable at all; so I would never use it”. Brian sees no real conflict between traditional and “progressive” musicians. “The music is evolving naturally; as it must. It can’t be set rigidly in any one period or style, or it will become sterile and lifeless, and performance will become mere recital. Techniques are developing, as they have done for centuries. If something is good, it will be accepted by the main body of musicians; if it’s not, it’ll just be ignored. The most brilliant tune won’t be widely played if it’s seen as just a technical exercise. The most popular tunes are relatively simple anyway. Music has to mean something to people, or they just won’t bother with it. There was a crisis in the middle of this century, but now interest is so widespread and so enthusiastic that its future health is assured. There are thousands of instruments out there, and most of them are being played for pleasure, by people who have no desire to be on a stage. They play for their own enjoyment and satisfaction, which is the best motive there is”.